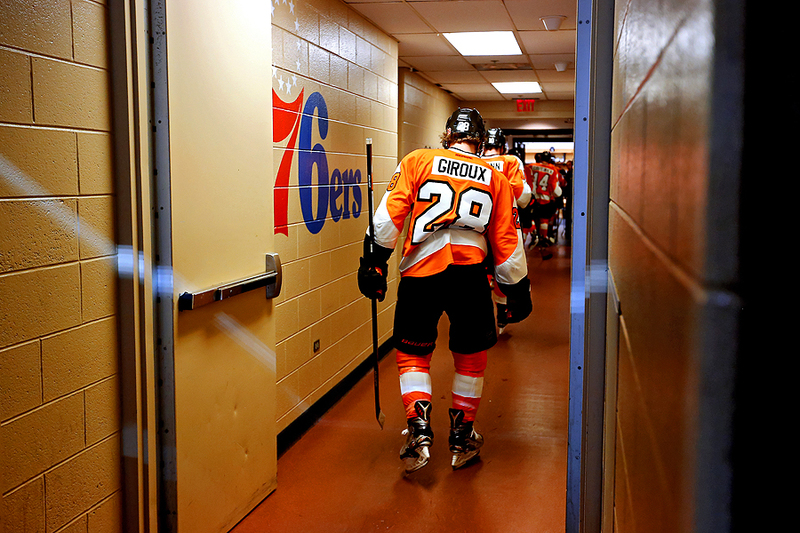 "Claude Giroux #28 of the Philadelphia Flyers walks to the locker room after losing to the Dallas Stars at Wells Fargo Center on March 10, 2015 in Philadelphia, Pennsylvania." There is nothing more telling than when an athlete lets their guard down. Win or lose, joy or sorrow, the minute they walk off the playing field is when real emotions come through. Unfortunately, these type of solitude moments are hard to come by in professional sports. Getting access is often forbidden, and without it, photographers are left to tell the story of the night by documenting images on the playing surface. In Philadelphia, the arena is setup a bit different than other hockey venues around. I recently found that the tunnel to and from the locker room was accessible without being obtrusive. A small cutout path between the exit of the door and the access to the bench made images possible. After getting permission to shoot available light and remain behind the line, I tried to work the scene the best I could as players walked out for the game. To my dismay, it was rather dark and tough to document with the allowed angles due to staff blocking the open pathway. At the end of the game, I took the risk to shoot again, knowing I could maybe lean out a bit further once the last player walked by. That extra lean, paired with the body language of the athlete and behind the scenes vantage, helped make a telling image of the night.